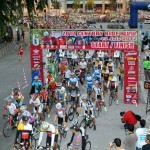 THE sixth instalment of “Century Ride Malaysia” rode its way into the Malaysia Books of Records for having the largest number of participants in a road cycling event. A total of 1,808 Malaysian and international participants were flagged off on their 160km journey by state executive councillors Datuk Hamidah Osman and Datuk Zainol Fadzi Paharuddin, near the Kinta Riverfront Hotel in Ipoh on Sunday morning. Event coordinating director Alice Chim said the participants had come from as far as Germany and Japan. “The largest group of foreign participants was from Singapore with about 420 cyclists,” she said, adding that the event was organised by Kelab Roadrunners Ipoh cycling team. Chim said although it was a fun ride for families, most participants had joined “Century Ride Malaysia” to challenge their physical and mental prowess. “While most foreigners are here to enjoy the sights and food in Perak, some took the challenge very seriously by riding non-stop throughout the journey,” she said. Participants cycled past lush greenery and hilly terrain from Parit to Senggang and then to Karai, Lasah, Lintang, Jalong, Sungai Siput and Chemor before heading back to Ipoh. Participants who crossed the finishing line each earned themselves a finisher’s medal and certificate of participation. Mentri Besar Datuk Seri Dr Zambry Abd Kadir, who was also present, said he had advised the organising committee to hold the flag-off near the hotel in order for more people to get to know about it. “They have initially wanted to flag off the event at a secluded area far from the city but I wanted the event to be known by more people and to be a success,” he said. An avid cyclist himself, Dr Zambry said he had thought about joining the event but unfortunately due to his hectic schedule, was unable to do so.